While there are many amazing things about having kids, one of the best is being able to play like a little child again, with your own child. As we become adults and travel through our 20s and early 30s with amazing enthusiasm about the future, we also tend to put our inner child aside, or maybe ignore them completely. While it is ok to move through life with career motivation and drive, it is important that we always remember where we started out in life. Sometimes with all the hustle and bustle of busy work schedules and other various life responsibilities, we forget about the little child within us that will always require nurturing, attention and love. The work world can take over, making us become workaholics at times and forgetting about what is most important in life. Many of us lose our inner child all together, making us feel lost and incomplete. We must always reach out to the little one in all of us, and one of the best ways to do this is by having children of our own. While there are many amazing things about having kids, one of the best is being able to play like a little child again, with your own child. In our society, if you were found playing with some toys by yourself or using your imagination on a grand scale, it would be considered strange and might raise many questions. Yet, when you are with a child, it is completely acceptable. Embrace playtime with your kids and both of you will reap the benefits. Recently, when I took my two-year-old to a toddler playgroup at the nearby school, I began to remember my days in elementary school. Specific smells, pictures, and general feelings of nostalgia came flooding back in and made me quite emotional. I realized I had lost my inner child for many years and abandoned her once I hit 18. Having children will allow you to re-connect with the innocent little child that may have been left behind at some point in your life. Watching your child play with other kids in playgroups or kindergarten and doing some of the traditional tasks and activities that have been carried on since you were young will really open up old memories. Another wonderful fact about having children of your own is that you get to use your imagination once again. You may have put crafts, creative projects and pretend-play on the backburner, but when you have kids, you naturally fall back into all of these with ease. It is natural to fantasize and create stories in our minds. Some of us forget to appreciate the power of our imagination. When you have kids of your own, let is soar freely! 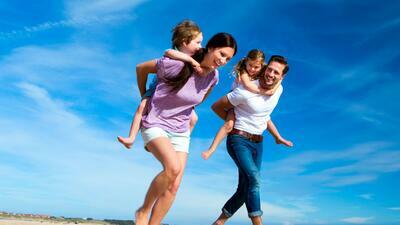 Not only will you feel younger and happier, your kids will love it when you join in with them! How has having children allowed you to re-connect with your inner child? Please share with us!